It is almost time for the kids to go back to school! The beginning of the school year for mosts kids can be quite exciting as it is a time for new item school items. I know my boys get excited for back to school shopping. My boys love to select new shoes and new backpacks. These new items in return help them get excited about returning to school. For many kids, new items are not a reality for them. For some families, money is tight and these kids are unable to come to school with the basic essentials that are needed for learning. Office Depot wants all kids to have a fair chance when it comes to learning. The Office Depot Foundation for the past 17 years has donated more than 4 million Sackpacks to children around the world. These colorful sackpacks include some basic school supplies so kids are able to have a fair chance when it comes to learning.This summer Office Depot, Inc. will be donating 100,000 colorful new sackpacks to nonprofit organizations, schools, and agencies across the United States and internationally. The foundation will also be hosting some back to school celebrations in select cities in the U.S. in July and August. 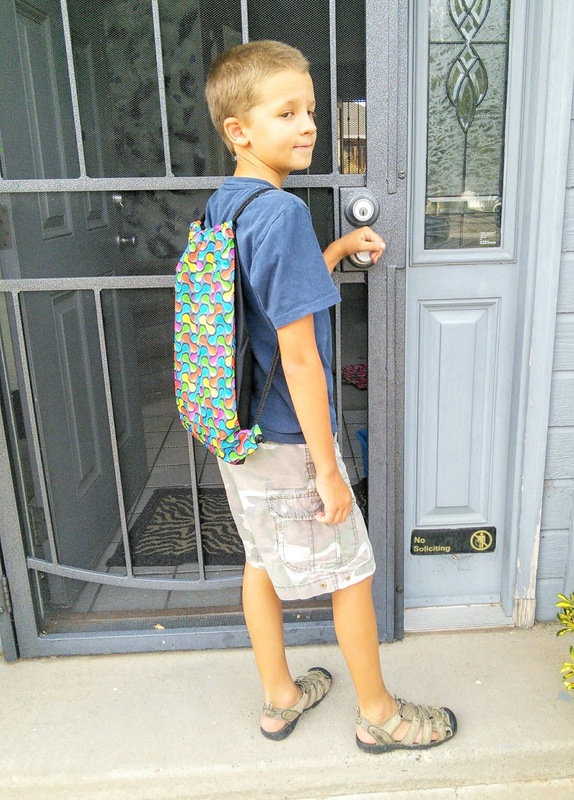 It is amazing how a simple sackpack can get a child excited about going back to school. This year, in addition to donating sackpacks to children who need them most, the Foundation is highlighting the importance of STEM and STEAM (science, technology, engineering, arts and math) programs in our nation’s schools. To encourage kids to explore these important curriculums, the Foundation has partnered with Captain Vernice “FlyGirl” Armour, America’s first African American female combat pilot, who will make special guest appearances at the Foundation’s Back-To-School celebrations in Los Angeles and Chicago. 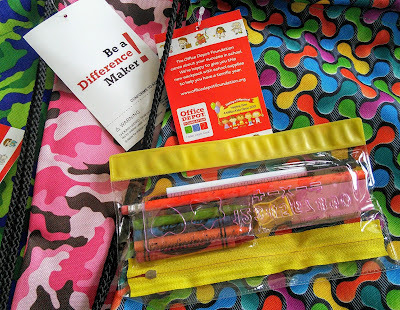 Sponsored Post: I was sent sackpacks from Office Depot to help promote this program. More information about the National Backpack Program can be found on the Office Depot Foundation’s Facebook page at www.facebook.com/officedepotfoundation. To learn more about the Office Depot Foundation and its initiatives, go to www.officedepotfoundation.org/. I love that these specially designed, drawstring-style sackpacks come in bright and fun colors. 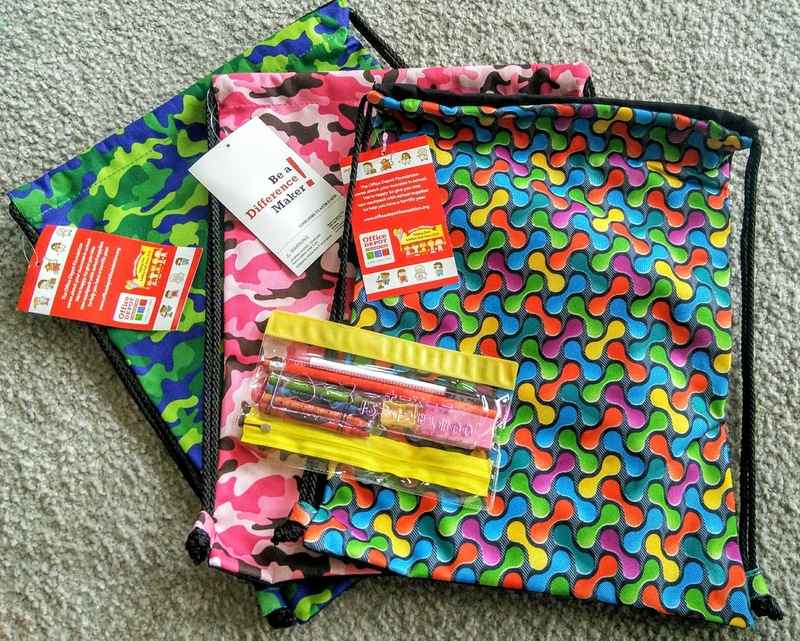 Each one includes a zippered pouch containing a pen, pencil, pencil sharpener, eraser, six-inch ruler and four crayons. How great are those sackpacks and it is awesome to know that they are helping kids who perhaps don't have the great start in life to make sure they have the tools needed to learn. What a great program! I have donated to school supply drives before because every kid deserves an equal start at an education. My daughter is always thrilled with back to school shopping! I hope every kid in the world gets to feel the excitement of new school supplies. This is a great advocacy. I'm hoping to support causes like this starting in our locality. Last year I had fun shopping at Target & getting all sorts of school supplies to donate for foster children in Arizona ... as my boys are grown & I don't get to take them shopping any more. The National Backpack Program sounds like a fantastic idea. I will have to check out the Office Depot Foundation’s Facebook page. These backpacks look so light. Thanks for sharing. This is awesome! Although I have not heard of this program before, our family always tries to purchase a full list of supplies for a girl and a boy in my sons school! Will be looking into for sure. We always try to help when we can. This is so so awesome! This is such a great program. I'd definitely love to contribute to programs like this. I always find it humbling with companies give back like that. Kudos to Office Depot! Such an amazing program for back to school. I love all of the colours on this. I never thought to hit up Office Depot for school supplies. I will have to check them out, ours start school very, very soon. Thanks for the heads up! Kids will be excited to use the content and the back pack per se. Nice initiative by Office Depot! Kudos to Office Depot for the Sakpack program, and for the STEAM program. STEM is important but so are the arts because they encourage creativity, which benefts STEM. Great initiative by Office Depot Foundation. And kudos to you for sharing this to some of your kid's schoolmates who are less fortunate. We need these kinds of foundations in the world. Our children should be provided with all their basic needs for education. Much appreciated such a great amount for this data I need to tell you I agree on a few of the focuses you make here and others might require some further survey, however I can see your perspective .